Since you can’t very well create animation with a story, you’re gonna need script writing software. Below is a list of 21 alternatives (read: cheaper) to Final Draft. Personally my favorite is Adobe Story mostly because it syncs to The Cloud and allows me to use it on multiple computers but you might have different ideas. Based on the Firefox engine, supports standards, visual storyboarding, prod. sceduling, publication and international languages MUI support. you can even get a portable version by googling for it. . Simple and powerful application for writing movie scripts. Adobe® Story software lets you outline your ideas, write scripts quickly with automatic formatting, and collaborate online. 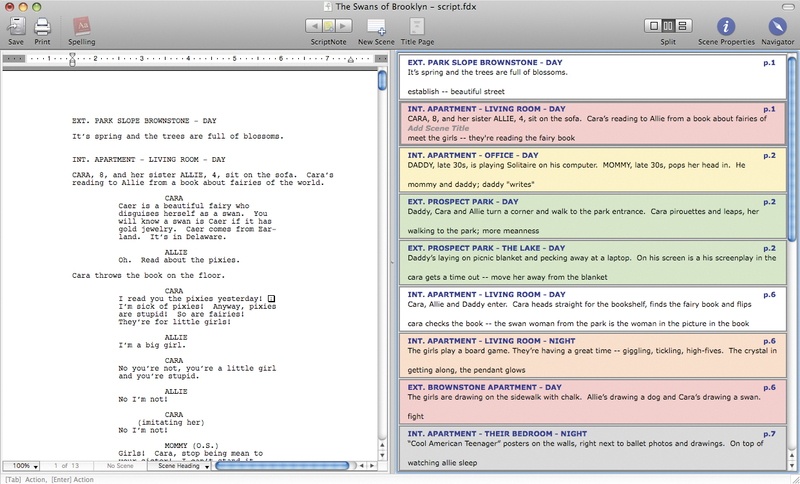 Plotbot is free screenwriting software. You can write your screenplay with as many or a few people as you want–right from your browser. We handle the formatting so you can concentrate on writing! Designed exclusively for Mac OS X, Storyist is a powerful story development tool for novelists and screenwriters. Outline 4D is an outlining and writing program that lets you brainstorm, create, structure and organize your ideas. CopyWrite is the award-winning creative writing project management system for Mac OS X.
Slugline is a minimal, distraction-free environment for the most important part of screenwriting—the writing part. Slugline works with plain text. Fade In Professional Screenwriting Software is a complete application for writing motion picture screenplays, including tools for outlining, organizing, and navigating, plus extensive screenplay formatting. Page 2 Stage is screenwriting software designed expressly for people writing screenplays, scripts, and plays. It provides numerous features needed by screenwriters not found in standard word processors. Scriptware scriptwriting software, for writing scripts faster and easier than ever. Screenplay software for script writers. *** 2013 Macworld Eddy Winner! – Best of 2013 *** With Highland, crafting a perfectly-formatted screenplay is as simple as writing an email. Just type. Highland will make it look good. Helps writers become authors. BlankPage is a full writing environment with a minimalist text editor, a powerful outlining tool, and social features all centered around motivational cues to help you keep writing. BlankPage gives you detailed statistics about when and how you write. Intelligent reminders for when you should write and a never ending stream of inspirational content to help you get going. Word processor specifically for screenplays. Tagged Final Draft, Software, Writing.